This article, God, is still being created by KingKatanova, he apologizes for the inconvenience. 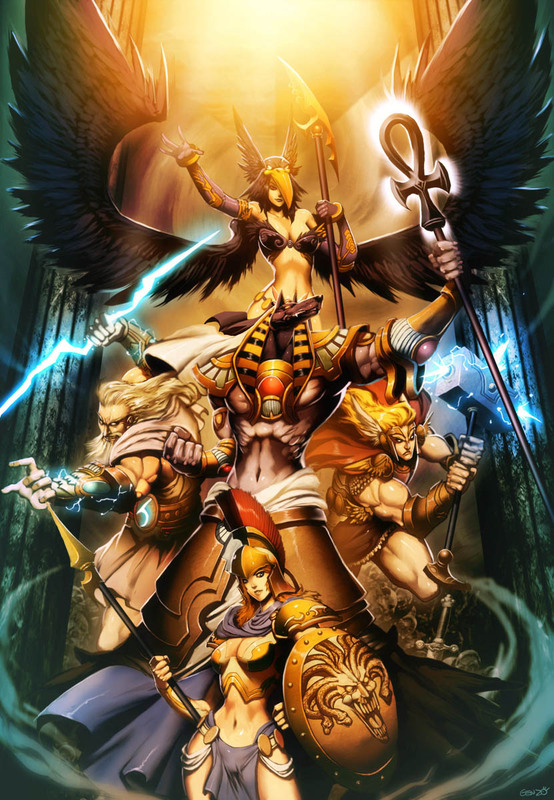 Gods or Goddesses are omnipotent beings which inhabit the realm of Infinia after the end of the Titans. Each of them represent an individual aspect of the Universe. The most prominent of these gods are the Eternal Ones & the Aspiral Kings. Gods came into being after the separation of the Titan Universe into the 3 realms of Infinia, Mortalia & the Blackness, which were formulated by the last of the Titans Khalaq & Deytro. The first of these beings were that of the Eternal Ones & the Aspirals, each of which were what remained of the two Titans after the seperation. For a God to remain within the Titan Galaxy they must possess magical energy known as Prayer. The more Prayer a God possess, the greater the powers that god has and the more influence that god has over Mortals. However with little or no Prayer left a god is then banished from existance forever. Titanborns are the first gods to have been created within Infinia, they are the direct result of a Titan separating themselves into the realm in order to gain it's own sentience, Titanborn gods are by far the most powerful of the gods as there power is not directed by the worship of mortals but like their forefathers they feed upon the infinite energy generated from the Web of Creation, meaning its almost impossible to destroy a Titanborn. Mortalborns are gods which came to after after the Titans had died out following the Cosmic Divide, they are gods which can been created by the prayers of Mortals, with enough prayers of a specific wish the god takes form within Infinia, unlike Titanborns, gods born of mortal prayer are unable to empower themselves through the consumption of the Web of Creation, there only substance is through the worship of mortals which is chaotic and unstable but at a benefit of being far superior to that of the webs direct energy making Mortalborns given enough worshipers can overpower that of direct Titanborns without worship.